Four extra-wide slots work in concert with self-adjusting bread grips to center bread for precise, double-sided toasting. Dual cancel, defrost, and bagel functions let you toast to perfection. 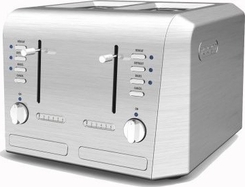 Dual electronic browning controls allow you to adjust toast color to your exact preference. Dual extra-high lift levers safely bring toasted items to the ideal height for easy removal. Dual slide-out crumb trays are dishwasher-safe, making cleanup a breeze. Cord storage keeps power cord out of harm's way when toaster is not in use. Non-slip feet safely secure the toaster during use.